In October of 1998 I was diagnosed with End Stage Renal Failure. This meant my kidneys were no longer functioning and I would need 10 hours dialysis a day just to survive. This would be a blow to most people, for me it was devastating. I was 33 years old and at the peak of my physical fitness working as a freelance mountaineering instructor and expedition leader. this point in my life I had invested 10 years in gaining the necessary qualifications and experience that would enable me to work within my chosen field, all this was being taken away. Adapting to life on dialysis was extremely difficult as there is absolutely nothing that can prepare you for the trauma of being diagnosed with a major illness. TONY WARD Although mountaineering has played a large part in his life Tony has also travelled extensively and had a colourful and varied career. This includes 5 years in the Royal Navy where he saw active service in the Falklands conflict, working in New Zealand on a bungy platform and working as a deck hand on an Australian prawn boat. As well as climbing in this country, Tony has climbed in India, Nepal, Morocco, New Zealand, Indonesia and the Alps. As an instructor/ expedition leader he has worked all over the UK and has successfully led expeditions to altitudes of over 6000m in the Himalayas. 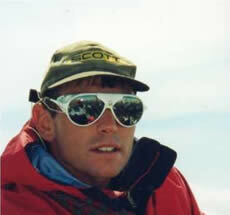 what I knew best - mountaineering. Although there were many physical and medical difficulties to overcome it was important that we approached our situation in a positive manner in order to regain some sort of normality back into our lives. This has been a great success and over the last eight years Bridget and I have completed a number of remarkable achievements. BRIDGET WARD works as a sales executive with an international management training company . She has many interests, which include horse riding and fell running. Bridget’s first ever climb 8 years ago was a Scottish grade 3 winter route in Glen Coe. 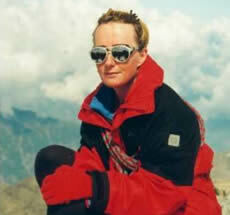 She has enjoyed mountaineering ever since and has climbed in Morocco the Alps and all over the UK.